LUHANSK, Ukraine -- A rumble of artillery prompts the biker gang to pause inside their stronghold. It has been some time since the rebel-held city of Luhansk in eastern Ukraine, on the war-torn fringes of Europe, has witnessed any frontline action. 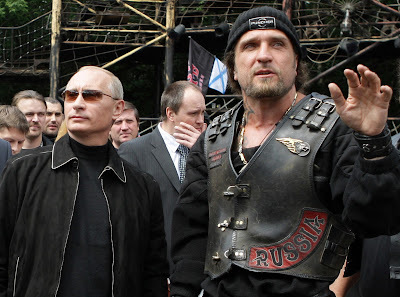 Vladimir Putin with the Night Wolves’ Alexander ‘The Surgeon’ Zaldostanov. They were anarchic petrolheads and now they’re the Russian president’s henchmen: meet the Night Wolves, Moscow’s most infamous motorcycle gang. An explosion sends pulses racing. “Finally,” grins one of the men. But, with a large gathering fast approaching, the bikers soon put themselves back to work. After all, their stage is not going to build itself. Their magical oak tree stands unfinished; a phoenix costume needs its full, resplendent plumage. Such are the confounding contrasts among the Luhansk chapter of the Night Wolves, Russia’s largest and most infamous motorcycle club. The men now busily constructing a winter wonderland for the children of this battle-scarred city are the same bearded, tattooed bikers who inject extreme, flag-waving nationalism into motorcycle rallies, who fight alongside Russian-backed, separatist militias, and deride the “Satanism” of the west. A few weeks later, the club would open its huge, rusting gates to the public, unleashing a strange brew of bike stunts, Slavic fairytales and patriotic pageantry, to see in the new year. Converted from a disused sports complex, the Night Wolves’ base is a militaristic, Mad Max mishmash of wrecked tanks, spent artillery shells and technicolour murals. At the rear, behind a museum of Soviet-era cars, the men grow vegetables and tend beehives. The stars of the forthcoming show are Luhansk’s own few-dozen Night Wolves. Denis Kuznetsov, the brooding, soft-spoken deputy commander, has left his wife and children in Moscow to support Ukraine’s pro-Russian insurgency; Vitaly “The Prosecutor” Kishkinov is their severe, swaggering boss; Sergey “Mosquito” Komarov is a baby-faced biker whose warmth and ebullience at times fail to eclipse the lasting trauma caused by fighting in Russia’s ruthless campaign in Chechnya. Then there is Shamil Shakov, a psychologist from Siberia, whose stillness and new-age spirituality have led him to serve as the group’s unofficial sage. Despite their penchant for chromed theatrics, the Night Wolves are no marginal subculture: they ride at the vanguard of Russia’s new wave of ultranationalism. The club boasts thousands of members across eastern Europe and enjoys close relations with the Russian president, leading some to dub them Putin’s Angels. Their presence here – and their role in the ongoing conflict – sheds light on the war in Donbass (eastern Ukraine), on Putin’s style of domestic politics, and on Russia’s ever-deteriorating relationship with the west. While its Moscow HQ has had international media attention, the club’s outpost in the self-proclaimed Luhansk People’s Republic (LNR) remains largely unreported. But after more than a month of negotiations, a small team and I secured unrestricted access to shoot a documentary about the group. Weighed down with camera gear, our pockets stuffed with roubles, we crossed the conflict’s buffer zone and journeyed deep into the country’s separatist heartland to meet them. On a cold, grey morning in Luhansk, one of Ukraine’s bleakest and best-preserved Soviet cities, we meet Kuznetsov at the Night Wolves’ base. In the courtyard, club members arrange props and saw logs for the forthcoming show. Framed by the flag of Novorossiya, Ukraine’s loose confederation of rebel-held territories, Kuznetsov wears a biker jacket over military fatigues, his olive-green beret badged with a hammer and sickle to round off the Easy Rider guerrilla look. For the Night Wolves, image is king. “Everything was inspired by American clubs, even the way we dress,” Kuznetsov explains. Kuznetsov joined the Night Wolves in the early 90s, after meeting the club’s charismatic leader, Alexander Zaldostanov, who trained in medicine and is known as “The Surgeon”. Kuznetsov’s role in the club would eventually shift from motorcycle enthusiast to militant fighter. As the Maidan street protests engulfed Kiev in the winter of 2013-14, in a bloody push towards integration with Europe, he was among a swath of ethnic Russians who saw only a violent coup d’état. Stoked by the Kremlin’s narrative that Ukrainian “fascists”, aided and abetted by the CIA, had overthrown a legitimate, pro-Russian government (the notorious kleptocracy of Viktor Yanukovych, accused of presiding over a “mafia” administration that cost the country billions of dollars), Kuznetsov left his family in Moscow in February 2014 and headed south. He and other bikers actively engaged in Russia’s covert invasion of Crimea, swapping leathers for body armour; that summer, they joined Ukraine’s separatist insurgency. “The Maidan movement was starting in Crimea. We decided to invest all our strength in preventing it,” Kuznetsov tells us one evening in his sleeping quarters, over shots of fiery moonshine. Religious icons, separatist banners, war medals and Kalashnikov rifles furnish the room, alongside a wolf-emblazoned dreamcatcher and a portrait of Kuznetsov’s grandfather in the second world war. “The Night Wolves built the first checkpoints,” he says. The US later sanctioned the Night Wolves for storming a gas facility and Ukrainian naval base on the Black Sea peninsula, blocking any assets they might have in the US and banning contact with US citizens – a token gesture, given the unlikelihood of patriotic Russians investing there. Meanwhile, in Moscow, The Surgeon received a medal for his efforts. For Kuznetsov and his fellow Night Wolves, the collapse of the Soviet Union remains a source of profound regret; Crimea’s annexation gave them the perfect opportunity to help Russia reassert its strength and resurrect a lost domain. “The USSR was the most powerful empire in the world,” he muses one cold, overcast morning, walking among the carcasses of Soviet-era tanks salvaged from the Donbass battlefield. He recounts the penury of Moscow in the chaotic aftermath: empty shops and queues to buy basic groceries with coupons. For Kuznetsov, the west can tolerate only a crippled post-Soviet state, not a resurgent Russia. But Kuznetsov’s role in Moscow’s annexation of Crimea, and in the conflict in Donbass, has come at a price. He has received medals but barely been home. “To be honest, I’m a real traitor: I betrayed my family,” he admits. The USSR was the most powerful empire in the world. And in one hour, without a single shot, it was over The Night Wolves first roared out from Moscow’s 1980s underground. In the liberalised environment that flourished under Mikhail Gorbachev’s perestroika reforms, kindred bikers and metalheads partied to rock music, provided security for bands and ran protection rackets, tearing around the capital on their Soviet-era Dnepr, Jawa and Voskhod motorcycles. “We were a powerful band on wheels,” Kuznetsov recalls. Since those early years, he and his fellow Night Wolves have evolved from an anarchic posse of petrolheads into a key component of the Kremlin’s propaganda machine. August 1991 marked a pivotal moment, as they moved in from the margins to join the resistance against the failed anti-Gorbachev putsch launched by communist hardliners. In Russia’s rocky 90s, the club began hosting annual motorcycle shows and launched a Wolf Wear clothing line. Putin has since become its most powerful patron, sanctioning huge grants and driving a three-wheeled Harley-Davidson as a Night Wolves outrider. They ride across Slavic landscapes to Orthodox holy sites, and stage shows that combine stunts, special effects and hard rock with zealous patriotism and pyrotechnics. Russia expert Mark Galeotti, a professor of global affairs at New York University, says the Night Wolves are not part of the counterculture; they are “countercountercultural”, acting as “outlaws yet tools of the state”. In other words, the Kremlin has brought them in from the fringes to exploit their pro-Putinism, fervent Orthodoxy and anti-American rhetoric as a potent source of soft power. A Harley-Davidson rally from Moscow to Berlin last April retraced the Red Army’s route to commemorate the defeat of Nazi Germany; in August, in Sevastopol, the bikers staged a second world war re-creation in a performance complete with lasers, rock music and motorcycle stunts. Meanwhile, opposition activist Alexei Navalny has uncovered the flow of millions of roubles from the Russian government to the club, including funds to perform anti-western children’s shows. Throw in their Soviet revivalism and large cache of assault rifles, and you have quite a cocktail. Anyone can apply to be in the Night Wolves. On our first day in Luhansk, Vitaly Kishkinov, the bullish boss of the local chapter, gives us a tour of the base. Over the next week, we get to know his men beyond the two-dimensional characters the club so readily projects. Kishkinov, however, remains stubbornly opaque and ideological – a consummate rebel leader. “I love my country, I received it with my mother’s milk,” he tells us in front of a large mural inspired by Mad Max, featuring a fanged, fuel-belching tanker bursting through a brick wall. For Kishkinov, the irony of delivering such a patriotic monologue against the backdrop of a Hollywood hit is no obstacle. Kishkinov, whose wife and two children live elsewhere in Luhansk while he immerses himself in the club, takes us to what he calls “the museum” – part games room, part shrine. A billiards table is draped with wolfskins. One corner is dedicated to his celebrity friends, including photographs of crooner Grigory Leps, who was sanctioned by the US for suspected mafia ties. Orthodox icons and crucifixes plaster the walls, alongside portraits of Stalin and Ramzan Kadyrov, Putin’s puppet warlord in Chechnya. Who can join the Night Wolves, I ask Kishkinov. Kishkinov, whose star in the Night Wolves has risen alongside Russia’s hard rightward, homophobic turn, looks incredulous. Kuznetsov would go even further. In a war often viewed in hyperbolic terms – the Ukrainians brand the enemy “terrorists”; Russian-backed forces claim to battle “neo-Nazis” – he employs a phrase more readily associated with militants waging jihad. “We’ve seen many miracles here. We’ve seen bombed churches where people survived,” he says. When separatist tensions in the Donbass region erupted into open warfare in the spring of 2014, claiming more than 9,100 lives to date, the Night Wolves were among the pro-Russian fighters deployed to carve out breakaway “people’s republics”. Several members were killed and the US government later alleged close links between the club and Russian special forces. The Night Wolves had evolved from a tool for exerting soft power to something harder and more violent. As the front line ossifies into a de facto border, the group has integrated with the rebels’ internal affairs ministry, retaining a paramilitary function and substantial arsenal. But it has also returned to its civic roots: staging patriotic events, campaigning against corruption, participating in urban renewal, delivering humanitarian aid – much to the adulation of the local population. Putin’s brand of politics has created an environment in which such an organisation can thrive. His brash cult of the macho celebrity is the modern-day cult of Stalin. Here, in a political arena as manipulated as a daytime melodrama, Putin is at the top of the A-list. “This man has leadership,” Kuznetsov insists. Stalin has enjoyed a renaissance, too, as the Kremlin harnesses Soviet nostalgia to reconnect with Russia’s superpower past. The Night Wolves’ reverence for the dictator is clear even before you step inside their base. A flag bearing Stalin’s face adorns the entrance gates, while three other banners show Jesus Christ, the tricolour of the Russian Federation and the LNR’s red star emblem. On arrival in Luhansk, we visited the rebel regime’s ministry of information, a vast monolith housing a warren of corridors and sullen bureaucrats. We tried to shrug off both incidents as amusing quirks, but they would come back to haunt us. We spend the following afternoon in the snug sentry hut of the Night Wolves’ base. Over cups of tea and bread smeared with salo (pork fat), Sergey “Mosquito” Komarov tells us how his life led to this moment. One of the most affable members of the chapter, he was born in a village outside Moscow and, as a teenager, served as a tankman during Russia’s brutal bid to crush Chechen resistance at the turn of the millennium. It is clear the experience caused Mosquito subtle but long-term psychological damage. Biking offered a kind of therapy. “What have I gone through? A lot. It took me two years to get over it,” says Mosquito, now in his early 30s. While running humanitarian aid to a frontline town in Ukraine last year, he met a local girl, Nadia, whose father had already left home to fight with the separatists. She later moved in with Mosquito at the base. “We didn’t choose the life we have,” says Nadia, 19, resting against him in the sentry post. Their rapport is touching, almost innocent – the sort of relationship born out of chance meetings amid the ravages of war. Before our arrival, a two-month lull broke down as both sides re-engaged in trench warfare, nightly bombardments striking the outskirts of the separatist stronghold of Donetsk. The frontline near Luhansk is calmer, though the remnants of 2014’s conflagration appear everywhere: boarded-up shops, tarmac cratered by mortar fire, buildings demolished by airstrikes and artillery attacks. The most dramatic destruction lies several miles away at the airport. Clashes between pro-Kiev forces and separatist militias, including members of Luhansk’s Night Wolves, backed by the might of the Russian army, dealt the terminal near-total annihilation. On a bright, windswept morning, Kishkinov shows us the devastation, navigating the massive craters that rupture the runway. One lone worker clambers over the rubble to collect an armful of bricks before walking down and dumping the debris on the ground, only to repeat the endless, empty exercise. “Everything was destroyed,” Kishkinov says loudly, over the wind. In the shadow of the ruined terminal, I press him on Russia’s involvement in the war, long denied by Putin until recently, despite overwhelming evidence to the contrary. Surely he encountered Russian troops? Surely the blame for war cannot rest solely with Ukraine? “Russia is not concerned here,” Kishkinov snarls in heavy, expletive-strewn Russian. We continue the final leg of the tour in silence as Kishkinov storms ahead. Rainclouds barrel across the sky and we depart. Like Sisyphus, the lone figure continues to toil at his impossible task, dismantling the ruined airport stone by stone. The presence and influence of the Night Wolves in Luhansk underscores the bitter ethnic rift that runs through Ukraine. Many in the chapter are local men, yet align themselves with Moscow over Kiev, in spite of their common past and language. Regardless of his militant creed, it is a divide that troubles Kuznetsov. “There was a moment when we were fighting last year,” he says. It was to be our final night at the base; we kept the camera rolling amid a fug of cigarette smoke while talking and trading ideas with the bikers in their sleeping quarters. Two hours before the start of military curfew, we received a tipoff that the authorities had deemed us no longer welcome and had issued an arrest warrant. Our fixer’s security and our reams of footage were at risk; we decided to hit the road as a matter of urgency. We shook hands with Kuznetsov, bade a swift goodbye and headed to the gates. Minutes later in the dark December chill, we spotted one of the older, more grizzled bikers on sentry duty. In the 90s, Ivar had seen action with the Russian army throughout the restive Caucasus. Now, in his 50s, he had found himself embroiled in yet another separatist conflict on the frontiers of Russia. The headlights of our van appeared as our fixer raced down the track to meet us outside the Night Wolves’ stronghold. Within an hour, he would be speeding towards the safety of the Russian border. I would bundle into a second car with my fellow film-maker, Sebastien, before navigating a series of rural backroads to avoid rebel checkpoints. We would grab a few hours’ sleep in a hostel near the frontline, leave before dawn and cross the conflict’s buffer zone into government-held Ukraine by lunchtime, our footage beyond the reach of any pro-Russia militias bent on confiscating it. Before that, we had just enough time to say farewell. The city lay silent beneath a cloudless winter night. Ivar gave us a warm smile but declined to return our goodbyes. “I’ll just say, see you soon,” he responded quietly.